A $2-million habitat restoration project on Belle Isle is expected to further the comeback story of fish on the Detroit River and make Detroitâ€™s island park a more desirable destination for anglers. The spring has been cold and wet not only for anglers, but for the fish they are angling for. The steelhead fishing in some rivers has been slowed a bit by this cold spring, says Heather Hettinger, Department of Natural Resources fisheries management biologist for the central Lake Michigan management unit. She oversees watersheds from the Platte, which dumps into Lake Michigan in Benzie County, to the Mackinac Bridge. 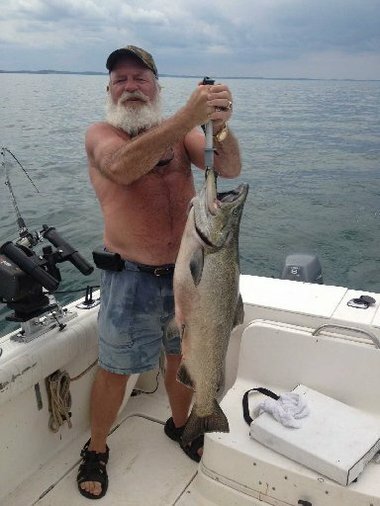 Anglers chasing transplanted Pacific Ocean salmon on lakes such as Ontario, Huron and Michigan occasionally tie up with a native lake trout and generally are happy about it. Lake Huron faces a barrage of environmental stressors, including loss of aquatic habitat, climate change, ongoing coastal development, invasive species and the water quality threats posed by toxic chemicals and non-point pollution, that is, runoff from farms and cities. 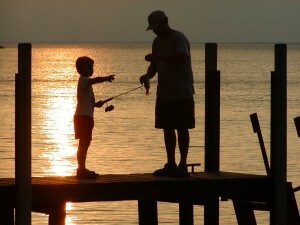 Want to make the most of your fishing day out on the Great Lakes? The Great Lakes Coastwatch is helping you do that. The Great Lakes Coastwatch site provides surface water temperature charts based on readings taken by satellite several times a day. Daniel O'Keefe, district extension Sea Grant educator with Michigan State University Extension, explains that two buoys in Grand Traverse Bay and Little Traverse Bay have "thermister strings," which means take temperatures at different depths in the lake. Much has changed in Michigan since 1997: Gasoline prices have tripled, food prices increased more than 40 percent and health-care costs have skyrocketed. Walleye and Yellow Perch hatches in Lake Erie's Western Basin were below average in 2012. That is the word from the Ohio Department of Natural Resources. The numbers come from the ODNR's yearly survey which is done in August every year. In that survey, DNR trawlers drag nets through targeted waters to collect and count the fish species in a designated area. In 2012, only about two young-of-the-year walleyes were collected per hectare of water. A hectare measures out roughly to 2.5 acres of water. Recent fluctuating temperatures have resulted in lower water levels in the Great Lakes and area officials and fishermen say it's a great cause for concern. Officials are monitoring the situation very closely. Windsor fishermen say the downward trend is alarming. Despite drought conditions, low water levels and a rash of disease in the white-tailed deer population, fishing and hunting remained a boon to the Michigan economy in 2012. A total of 97 pages are available.